You can find a lot of neat stuff if you rifle around in Emmanuel Saez's Home Page . Here's a paper on the evolution of income distribution in Japan: The Evolution of Income Concentration in Japan, 1885-2002: Evidence from Income Tax Statistics (a working paper by Chiaki Moriguchi and Saez, dated last August). How much of Canada's income goes to the rich? The June 2005 American Economic Review has a paper by Emmanuel Saez and Mike Veall on trends in income distribution in Canada. The paper can be found at Saez's website: The Evolution of High Incomes in Northern America: Lessons from Canadian Evidence . Their evidence for long term trends comes from income tax returns. Essentially Saez and Veall have looked at income tax returns for upper income persons in Canada, and compared the tax income estimates to overall estimates of national income from other sources. The limitations of the data prevent them from saying anything about the details of income changes below the 90th percentile. 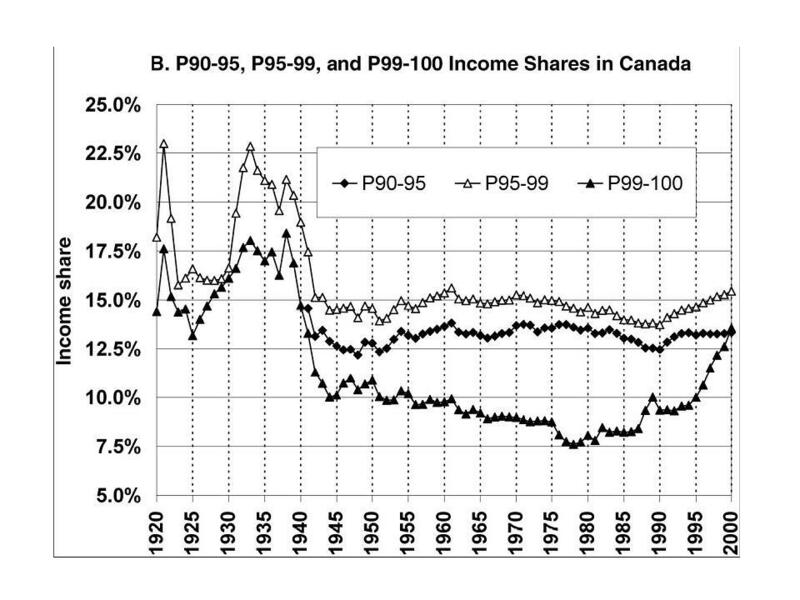 The figure shows the proportion of income accruing to top income percentiles (90-95, 95-99, and 99-100). The data for the 90-95 percentile grouping only becomes available after the World War. 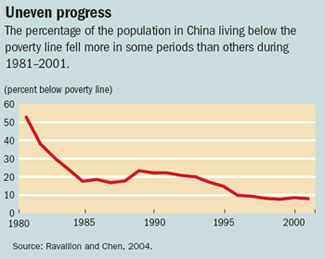 The World Bank has a short web page highlighting the work of its researchers Martin Ravillon and Shaohua Chen on poverty and inequality in China: Fighting Poverty: Findings and Lessons from China’s Success . 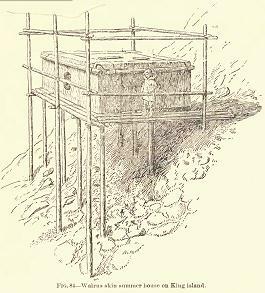 Ravillon is quoted as suggesting that this was a one-time reduction associated with picking the "low hanging fruits" of reforming China's hitherto horrible agricultural policies. Last year Kopczuk and Saez published estimates of top wealth shares in the U.S. from 1916 to 2000, making inferences from estate tax data. They found that levels of inequality were highest from 1916 to about 1930, that they fell during the depression and the Second World War, and that they'd remained fairly stable at the lower level since the end of the World War. The most plausible explanations for the facts are perhaps the development of progressive income and estate taxation which has dramatically impaired the ability of large wealth holders to maintain their fortunes, and the democratization of stock ownership which now spreads stock market gains and losses much more widely than in the past. 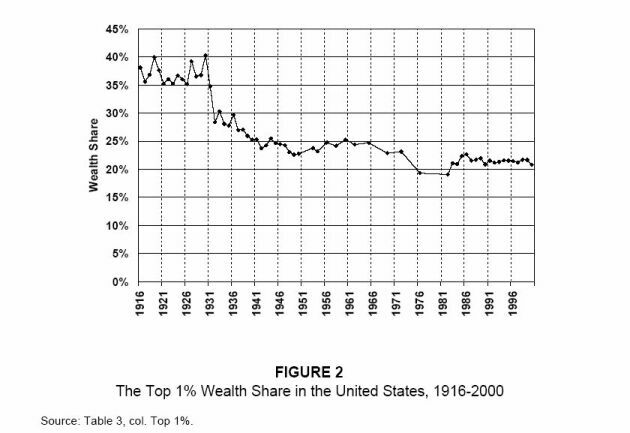 (Wojciech Kopczuk and Emmanuel Saez, "Top Wealth Shares in the United States, 1916-2000: Evidence from Estate Tax Returns" NBER Working Paper 10399, March 2004). Now Rosenbloom and Stutes have pushed back a little further - to 1870 - using data on property ownership from the 1870 Census. They find evidence that overall wealth inequality in 1870 was similar to, and maybe somewhat higher than, the post-World War II distribution. Compared to estimates for the early twentieth century, the distribution of wealth at the national level... was relatively equal. In 1870 the top 1 percent of wealth holders owned 27.9 percent of all property, about one-third less than was the case in 1916. 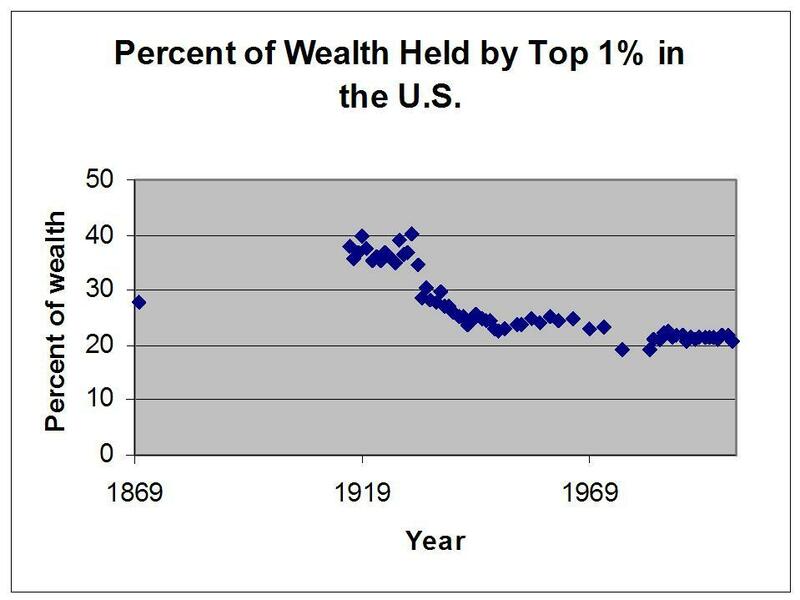 Thus, wealth inequality increased substantially during the period of rapid American industrialization in the late nineteenth and early twentieth centuries. The rise in inequality associated with increasing industrialization was prefigured in the pattern of cross-sectional variation in inequality in 1870. Inequality varied considerably across states, and much of this variation reflected differences in urbanization and manufacturing employment across states. For the most part more rural and agricultural states enjoyed a higher level of equality. The exception to this rule was, of course, the South, which remained in 1870 highly rural and agricultural. This exception is explained, however, by the legacy of slavery, which apparently permitted the emergence during the antebellum period of a much more unequal distribution of property than occurred in the North. This inequality managed to survive after the Civil War despite the strong negative effect of emancipation on overall levels of wealth holding in the South. Figure 2 in Kopczuk and Saez. Thursday I posted a figure from an NBER working paper by Thomas Piketty and Emmanuel Saez showing the trend in the proportion of U.S. income earned by the top 10% of income earners. You can get a copy of the figure, and the paper it's a part of, at Emmanuel Saez's webpage. The figure was striking. In 1917, the top 10% of "tax units" had about 40% of national income. The percent of the income earned by this group rose until about 1929, ranged from about 44% to about 46% until 1940, then plummeted to the area of 32% during the war, and sat there until about 1972. From 1972 to 1998, the share of income received by this group rose almost continuously, ending the period in the area of 42%. Just for reference, the average income threshold for entry into the top 10% was about $81,000 in 1998. 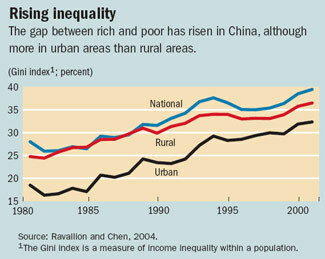 Kash, at Angry Bear, reports that the Economist has a survey article on Global Income Inequality. Kash provides key extracts. Changing income distribution in the U.S. 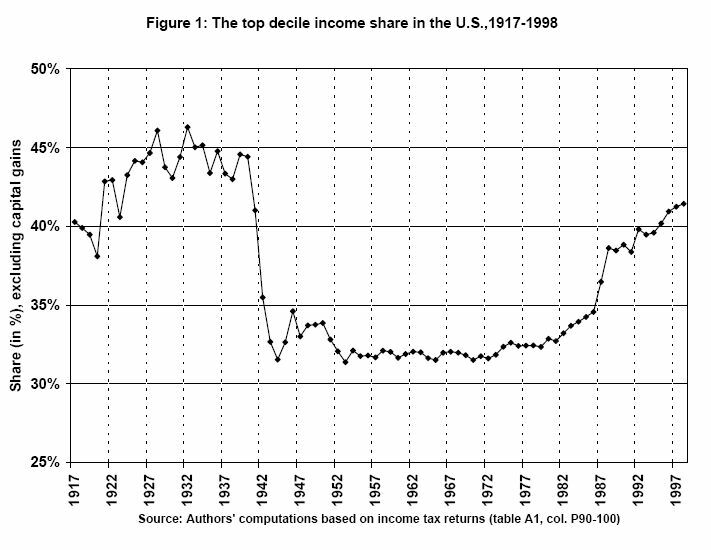 The following figure shows estimates of the top decile income share (excluding capital gains) in the U.S. from 1917 to 1998. The figure is from "Income Inequality in the United States, 1913-1998," a National Bureau of Economic Research (NBER) working paper by Thomas Piketty and Emmanuel Saez (NBER No 8467, September 2001). There's lots of interesting stuff in this figure - the increase in the top income share from 1917 to 1929, the plateau from 1929 to 1941, the collapse during the World War, the stable, modest percentage from 1945 to 1972, then the relentless increase, through Democratic and Republican administrations alike, from 1972 to 1998. "This paper presents new homogeneous series on top shares of income and wages from 1913 to 1998 in the US using individual tax returns data. Top income and wages shares display a U-shaped pattern over the century. Our series suggest that the 'technical change' view of inequality dynamics cannot fully account for the observed facts. The large shocks that capital owners experienced during the Great Depression and World War II seem to have had a permanent effect: top capital incomes are still lower in the late 1990s than before World War I. A plausible explanation is that steep progressive taxation, by reducing drastically the rate of wealth accumulation at the top of the distribution, has prevented large fortunes to recover fully yet from these shocks. The evidence on wage inequality shows that top wage shares were flat before WWII and dropped precipitously during the war. Top wage shares have started recovering from this shock since the 1960s-1970s and are now higher than before WWII. We emphasize the role of social norms as a potential explanation for the pattern of wage shares. All the tables and figures have been updated to the year 2000, the are available in excel format in the data appendix of the paper." I've divided the abstract into paragraphs for easier reading. Various measures of income distribution indicate that the proportions of income accuring to the top decile of the population is getting larger. But Kevin Brancato at Truck and Barter notes that "percentiles are not people." In other words, we need to take a look at what happens to individuals through time as well as what happens to percentiles, or deciles, or quintiles. Income mobility is an important dimension of the income distribution issue, and there is a lot of mobility in the U.S. through time. He posts here: "Percentiles are not People ". Brancato's post gives insights into the measurement and definition problems in this topic area, and has lots of links to other materials. The Economist has a nice little essay on the relationship between globalization and worldwide income inequality ("Catching Up. If You Consider People, Not Countries, Global Inequality is falling rapidly") - summarizing a talk by Stanley Fischer at this past winter's American Economic Association meetings . Fischer was a high official at the International Monetary Fund. The article is premium content on The Economist's web page, but Brad DeLong has provided an extract, along with the key graphic, here: "In Memory of Rudi Dorbusch". DeLong also provides a useful link to a copy of Fischer's original talk.